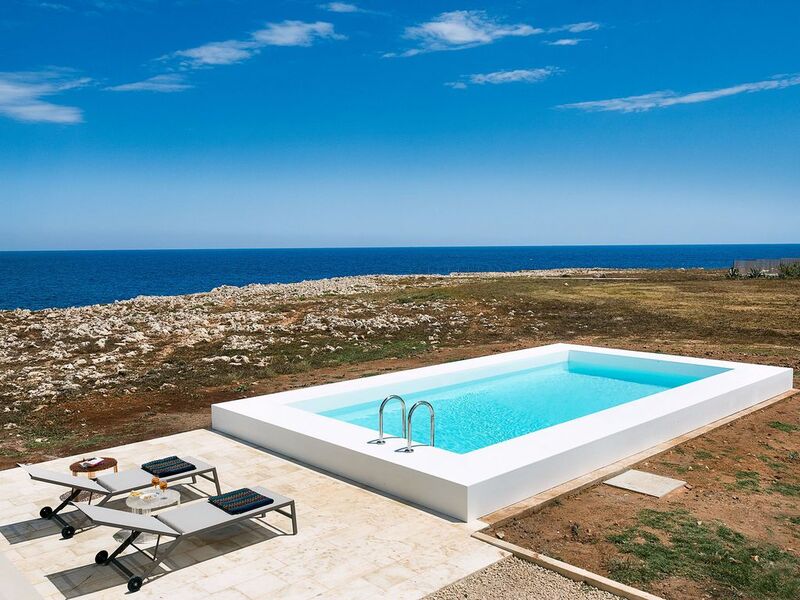 Villa Capo Passero is an exclusive cliff top villa with pool located a few hundred metres from the beach and the small town centre of Portopalo di Capo Passero, Sicily’s southernmost point. Its large, well equipped terraces and beautiful private swimming pool offer breathtaking views of the island of Capo Passero, whereas the sea is reachable through a footpath that winds along the cliff. The grounds surrounding the villa are left in their natural state with spontaneous plants of bougainvillea, dwarf palms and prickly pears. Refined, local materials were used in the house restoration intervention to achieve high standards of quality and efficiency. The elegant interior, fully furnished and designed to create a contemporary style, is equipped with air conditioning, internet wi-fi, satellite tv and washing machine. The main villa, that spreads on two levels, includes on the ground floor a large living/dining room, a kitchen and a toilet. On the first floor is the sleeping area with three bedrooms and two bathrooms. Adjoins the villa, an independent apartment consisting of a small living room with kitchenette, two further bedrooms and a bathroom. Villa Capo Passero is also a short drive away from the golden sandy beaches of Carratois, Isola delle Correnti and of the nature reserve of Vendicari, but also from the enchanting baroque towns of Noto, Modica, Scicli, Ragusa Ibla and Syracuse. MAIN HOUSE Ground Floor: living/dining room, kitchen open onto the living room, 1 bathroom (washbasin and toilet). First Floor: 1 double bedroom with en-suite shower, 1 bedroom with a French bed, 1 double bedroom, 1 bathroom with shower. APARTMENT (with independent entrance) Ground Floor: kitchen/living room with sofa bed, 1 double bedroom, 1 twin bedroom (bunk bed), 1 bathroom with shower.